Barn quilts, and barn quilt trails, have become signature projects in rural areas across the country. While cloth quilts are usually made up of a series of blocks pieced together, barn quilts are typically a single block or square. Most barn quilts are painted on boards and mounted on a barn or other building. Barn quilts, like cloth quilts, often reflect the culture and character of areas where they are located and are made for private and/or public enjoyment. Barn quilts are being created and installed around town through a town-school collaborative 'Art Around Town' project. 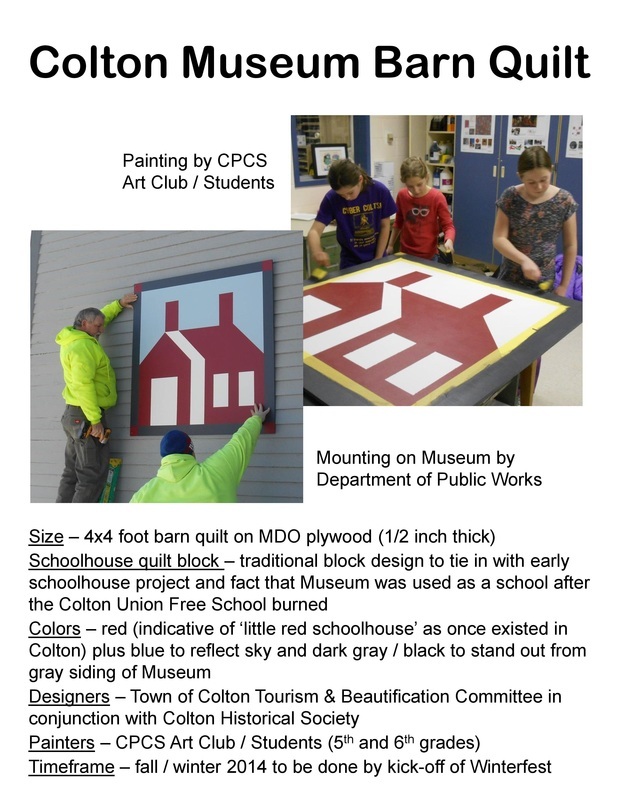 The town's Tourism & Beautification Committee is leading the project in collaboration with the Colton-Pierrepont Central School Art Department. We quickly exceeded our goal to have at least 30 installed for public as well as private enjoyment by the end of 2016. Photos of barn quilts are added to the website as they are installed and photos become available (click HERE to see our progress). The barn quilts connect well with the committee’s focus on heritage tourism, draw attention to the local quilting tradition and quilt events in the community and provide a wonderful opportunity for lots of people to get involved in town tourism & beautification activities. They also link the town to efforts underway by others in St. Lawrence County to put the county on the national barn quilt map. The first barn quilt done through the project, as described below, was installed in January 2015 on the river side of the Colton Museum before the town's annual Winterfest Weekend. During Winterfest while Thom Hallock of Mountain Lake PBS was in town to cover the Winterfest Quilt Show he learned about the town's barn quilt project and incorporated information about the quilt show and barn quilts into his weekly 30-minute 'Mountain Lake Journal' program -- http://video.mountainlake.org/video/2365414854/ (barn quilt story starts at 9:12). http://www.northcountrypublicradio.org/news/story/30823/20160128/news-from-the-eight-o-clock-hour-1-28-16 (story starts at 13.28 and ends about 22.20). Click HERE to learn more about the broader 'Art Around Town' project (under Government / Committees / Tourism & Beautification). And check ANNOUNCEMENTS for more information about basic 'how-to' workshops and painting sessions during the year!